Congratulations to D. Child who placed the winning bid of $2,000 for March's silent auction painting "Snow Drops", by Victor N. Butko, estimated at $3,500 to $4,500. 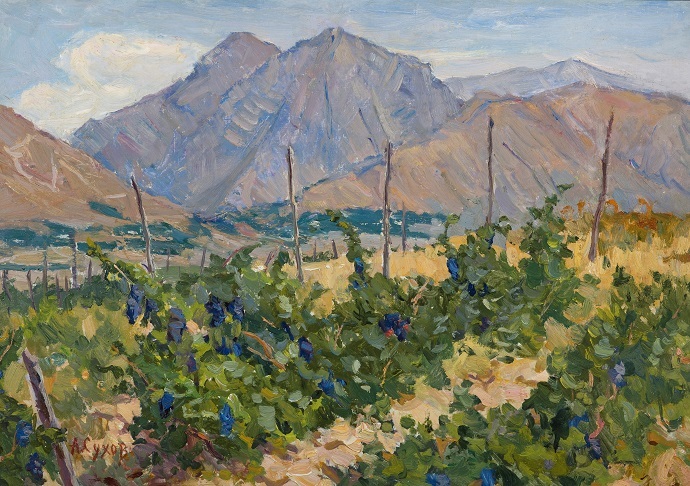 As our April silent auction selection, we are pleased to present this wonderful landscape, "In the Vineyard", by Alexander Pavlovich Sukhov, estimated at $4,000- $5,000. The owners of the McCarthey Gallery met with Alexander Pavlovich several times in his studio in the outskirts of Moscow. He was a humble and kind man who kept a large inventory of paintings at his studio. Over the course of his long career, weekdays for Sukhov were spent officially painting for the "State". However, his nights and week-ends were filled with painting that kept his soul happy. It was these personal paintings that filled his studio as during the Soviet time it was difficult, if not impossible, to sell art independent of the government. Over the years this allowed Alexander Pavovich to build up a great inventory of passionate work. 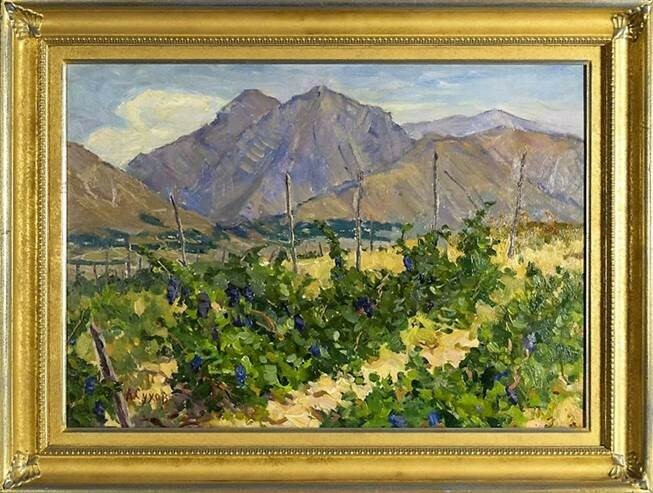 It is this quiet weekend painting which nourished his artistic spirit and produced this month's auction piece of a richly painted vineyard in Uzbekistan. Aleksander Pavlovich Sukhov, "In the Vineyard"
We invite you to participate in this month's auction and thank everyone who placed bids last month. This is an exceptional opportunity to add a beautiful work by a noted artist to your collection. Estimated at $4,000 to $5,000, the current high bid is just $2,750! The next bid is $3,000, followed by minimum bidding increments of $250. Remember, there is no reserve, at the end of the auction the high bid wins! Bids will be taken via telephone, or e-mail until 7:00 pm MST, Tuesday, MAY 1st. Sukhov was born in the town of Kasimov (Ryazan Region) in 1921. He lived and worked in Moscow since 1939. He was a member of Moscow Union of Artists and graduated from the Artistic College named after the Memory of the 9th of January in Moscow. Since 1953, he has been participating in the City, Republican, zonal and All-Union Art Exhibitions. In 1941-1945, he fought in the Great Patriotic War (WWII). As for his creative activity, the artist continued the traditions of the Russian realistic school. He successfully combined artistic touches of the academician art with free plein aire painting. Sukhov painted in various genres, such as complicated multi-figure genre compositions, official and chamber portraits, urban and his favorite rural landscapes. For many years, the artist made trips to gather material for his creative work. He visited different regions of Russia, such as Vladimir, Yaroslavl, Kostroma Regions, as well as Siberia and the Ural. The paintings of Aleksandr Sukhov are in the collection of many regional museums of Russia, as well as being included in a number of private art collections both in Russia and abroad.